We announced earlier that the 3DS eShop is coming, and here’s an extra little tidbit for you guys. 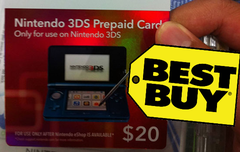 This 3DS Pre-Paid Card was spotted at a Best Buy by a user on Reddit. This means that you won’t have to divulge your credit cards to anyone(coughSonycough). Stay tuned to ZI for more updates on the 3DS eShop update.